We’d love your help. 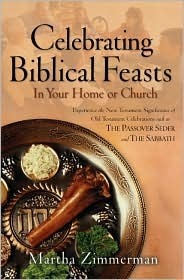 Let us know what’s wrong with this preview of Celebrating Biblical Feasts by Martha Zimmerman. To ask other readers questions about Celebrating Biblical Feasts, please sign up. This has been very fun with our homeschooling studies. However, the recipes are not very clear or detailed. So far I have had to look up other variations of the recipes online to find out certain details - like does meat need browned first, when do I add the barley, etc. Just sharing this as a warning for others who may try them out. We took a semester and celebrated the biblical feasts in our small group. This book was tremendously helpful and practical. Really made the feasts come to life.